He got everything else wrong. In other words, he got some things right and some things wrong. But 60 years before him, a different prognosticator laid out a different version of future—or, at least, a more fashionable one. That guy on the left up there? He’s a policeman, circa 1960. The man in the middle is a soldier. According to “W. Cade Gall,” who wrote in 1893 with pen-in-hand and tongue-seemingly-in-cheek, that’s what the fashions of the 1960s would look like. Gall, in fact, did this for every decade. You can see his predictions below. He was writing for The Strand Magazine, a British fiction and “general interest” publication that ran from the early 1890s to 1950. I found his story in the excellent Public Domain Review. Those notes, which start with Gall’s vision of fashion in the aughts and proceed chronologically, skew toward the medieval. Gall’s woman of 1912 seems downright princess-ly, and her male companion reminds me a little bit of the female Flappers that would follow a decade later. Trousers, which had been wavering between nautical buttons and gallooned knees—or, in the vernacular of the period, a sail three sheets in the wind and a flag at half-mast were the items sacrificed. 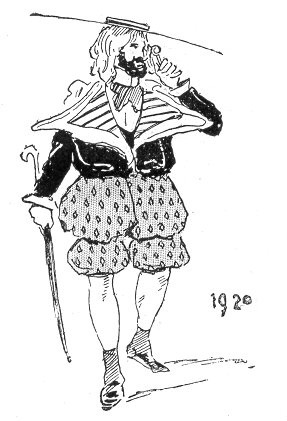 Knee-breeches enjoyed vogue for a time, but only for a time; for they vanished suddenly in 1930 and were replaced by tights or shapes. Gall’s sartorial sensibilities seem suspiciously satirical, but that doesn’t mean they don't bear some lessons. Though it may feel to us like fashion is nothing more than arbitrary throwback after arbitrary throwback, Gall predicts a more pointed throwback than has ever actually occurred. Medieval garments have never been back in style—though knightly shoulder pads have been—and that may be as much about technological production as anything else. We can mass-produce jeans a little more easily than frilly hats. Did Gall get anything right? Actually, yes. Cigars went out of fashion twenty years ago. Men and yeomen consumed so much tobacco that their healths were endangered. The laws of Nature were powerless to cope with the evil. Not so the laws of Fashion, which at once abated it. And indeed, according to Gallup polling, smoking began its slow decline in the year… 1973.